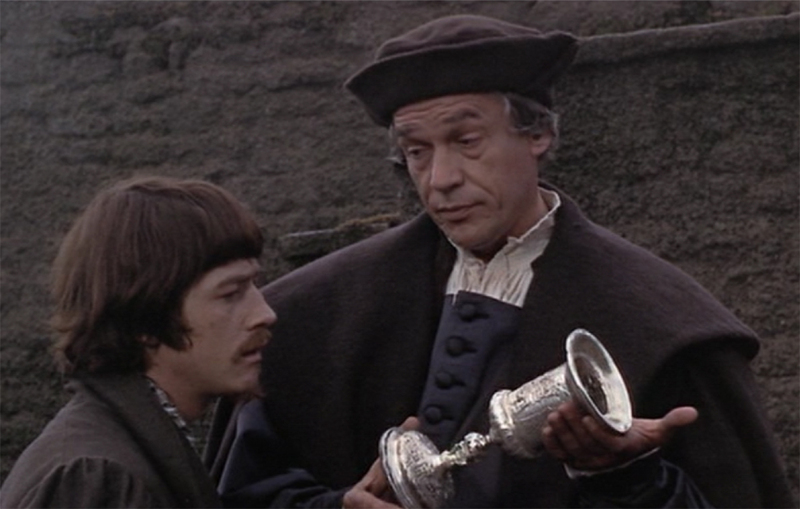 The above lines are the only direct reference to Thomas More’s 1516 work Utopia in the 1966 film A Man for All Seasons, directed by Fred Zinnemann. In fact, they are nearly an exact quote from Book Two of the original text as translated into English.2 In Robert Bolt’s screenplay, based on his own play, the above dialogue is among the first spoken words in the film. They are, however, only heard as background banter from a social gathering at More’s house and any connections between text and film would seem to begin and end there. More’s Utopia was published thirteen years before the events depicted in A Man for All Seasons, so why should we expect multiple references to the 1516 text? After all, A Man for All Seasons is in no way meant to be an adaptation of Utopia. Furthermore, the intrinsic differences between a Renaissance text and a twentieth-century film are both stark and myriad. Richard Palmer stresses this dissimilarity when he identifies that in A Man for All Seasons, “More’s decisions are motivated by a sense of self that reflects Bolt’s modern existentialism to a greater extent than to More’s humanistic Catholicism” (26). While linking Utopia and A Man for All Seasons may seem to strain traditional adaptation studies, there are, nonetheless, many strong traces of the text to be found in the film. Over the centuries, the interpretations of Utopia have ranged from seeing it as a blueprint for a Communist paradise to a self-entertaining exercise of a sardonic intellect, a jeu d'esprit.3 One of the main difficulties in analyzing Utopia has always been the obstacle of separating More the author from More the character, which, to some degree, is further obscured by what we know of the historical Thomas More, as suggested in the famous 1527 portrait by Hans Holbein (see Figure 1). It could be argued that the situation is only further clouded by the introduction of Zinnemann and Bolt’s depiction of More (see Figure 2). However, this essay postulates that the intertextual relationship between Utopia and A Man for All Seasons may help to reconcile the various interpretations of the 1516 work. The consonance between text and film can best be seen in the themes of humor, statesmanship, common sense, greed and what Bolt, speaking for More, might call “love right through.” These seemingly unrelated themes do more than connect a Renaissance text with modern cinema; by illuminating the enigma of More, we begin to bridge the gulf between idealism and pragmatism. However, before dissecting this unique intertextuality, Zinnemann’s film must be understood as reflecting a transitional moment in American cinema, one with liminal stylistic, narrative and ideological concerns. The film A Man for All Seasons sits at an interesting junction of American film history, and like all evolution, characteristics of both sections intermingle. The end of the studio era varies depending on the film scholar, but by 1965 the “Old” Hollywood had clearly given way, to a large extent, to a new independent style of production.4 The vast majority of major films, by the mid sixties, were created by independent companies with the old recognizable logos at the opening of the film referring only to distribution. Besides the change in productions entities, the language of Hollywood film was also changing, moving away from a strict emphasis on narrative causality, described by David Bordwell as promoting “temporal and spatial coherence,” to a style more similar to foreign films with less interlocking cause-and-effect (32). In this respect, the more traditional storytelling style of A Man for All Seasons is a holdover from the previous classical era. This also results, in terms of adaptation, in a major alteration in the feel of Bolt’s original stage production. Bolt’s play, with its “universal” Jederman, who plays several roles in the historic events and addresses the audience directly, is a reflective piece of theater. The original material is less an attempt at historical representation and more a physiological examination of the individual within history. A character addressing the audience directly is nearly non-existent in Classical Hollywood. If A Man for All Seasons had attempted to recreate this element of the play, it would have more closely resembled another 1966 film Alfie, a film that was relatively radical (but playful) in how it broke the forth wall. Zinnemann’s film is a straightforward, chronicle approach, which avoids the self-reflective ruminations of the play. It also boasts a more legitimate claim to historical accuracy than previous efforts in the genre of historical dramas.5 In Classic Hollywood, this genre emphasized the opulence of bygone eras, employing off-the-rack costume department apparel, and usually only used music of the period digetically. Even more distinctive of previous historical dramas was the flamboyant, even garish, cinematography of the early Technicolor process. While we cannot describe the 1966 A Man for All Seasons as employing a documentary style, especially when compared to Italian neorealism or even more gritty American films of the fifties such as On the Waterfront, the film does, nonetheless, attempt to be more realistic, avoiding the more melodramatic elements of previous Hollywood historical dramas. This new style of historical drama inspired a number of subsequent mimetic films, such as Anne of the Thousand Days (1969), Cromwell (1970), Mary, Queen of Scots (1971), and Nicholas and Alexandra (1971). The distinctions between these films and earlier entries in the genre are best demonstrated by comparing A Man for All Seasons with the lavish 1953 MGM production of Young Bess. This style, which is both typical and atypical of its genre, is one that avoids the modern existential elements of both Bolt’s play and other more “contemporary” films of the late 1960s. The desire to make the genre more suited to adults, more intellectual than opulent, and more historically accurate than melodramatic, is attributable in no small way to Zinnemann. An archetypal studio director, with a long list of critically acclaimed and award-winning films, Zinnemann certainly was central in losing the introspective and therefore overtly subjective view of Bolt’s play, a treatment that recalls a more traditional style in terms of classical film narrative than the increasingly common, more fragmented, and less plot-oriented American films of the period. However, Bolt’s play, which emphasizes the individual, and the revelation of meaning from the individual’s struggle against society, is one in which Zimmerman had previously shown great interest and even became a hallmark of his work. Two of his most acclaimed films, High Noon (1952) and From Here to Eternity (1953), center on a lone character’s struggle against a system that infringes on the protagonist’s sense of moral code.6 In each of these cases, as in A Man for All Seasons, Zimmerman employs a highly traditional story structure, but tweaks each films’ respective genres toward a more “modernist” view of the individual and society. This hybridization of style and era, this exploitation of liminal spaces, earned A Man for All Seasons great popularity at the box office and six Oscars, including Best Picture. Despite traditional elements, the film is, in its own way, a child of its period. Any attempt to interpret Utopia requires an understanding of the satirical nature of the original work. The very title, which can be translated as both “good place” and “no place,” warns us that the author, at times, may well be employing the satirical weapon of irony. While this reminds us of the playful nature of the author, it also encapsulates the question—when More describes a “perfect” society, is he being serious? The irony in More’s wordplay displays a duality, a mixture of humor and serious contemplation, which is the hallmark of Utopia specifically and Renaissance Humanism in general. For example, the very title Praise of Folly, a work by More’s great friend Erasmus, reminds us of the Humanists’ love of irony and satire. More’s sense of humor was not confined to satirical writing. We see in More’s comment to his executioner that humor was an inherent characteristic of the historic More even to the point of death. More reportedly asked that his beard should not be harmed because it had not offended the King. While A Man for All Seasons does not present this quip, it does exhibit many depictions of More’s sense of humor. 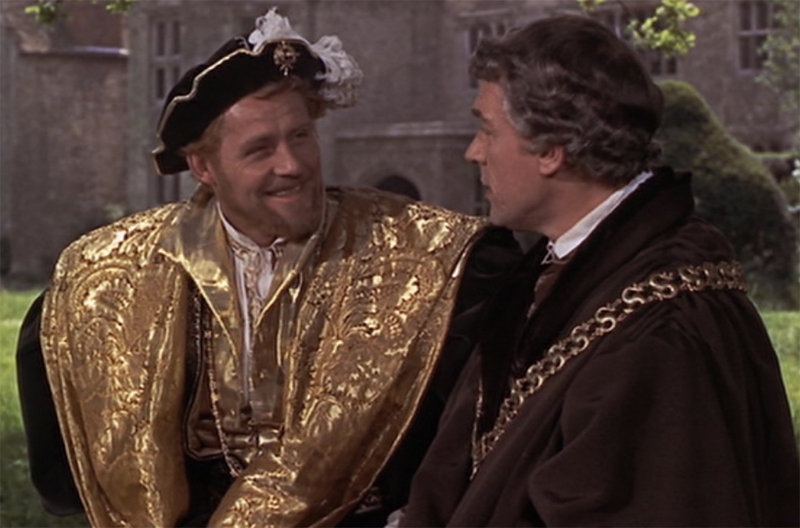 For example, our first glimpse of Thomas More, in the film, is at the previously-mentioned social gathering. He is laughing along with his guests. There is great significance in this. A Man for All Seasons deals with the end of More’s public life and specifically his conflict with King Henry VIII. These events are serious if not dire. The image of a laughing Thomas More should remind us, as we proceed to look for traces of the original text in this film, that the author of Utopia possessed a tremendous sense of humor. This is sometimes difficult to hold onto amid the film’s focus on the tragedy of More’s later life. The film reminds us of More’s humor at other moments as well. One example occurs when an irritated Wolsey demands of More, “The King needs an heir, what are you going to do about it?” More sarcastically responds, “I’m very sure the King needs no advice from me on what to do about it.” Another such moment occurs when, in the early hours of the morning, Will Roper asks to marry More’s daughter. More denies him on the grounds that Roper is a heretic. Roper becomes defensive. More’s daughter interjects herself, in an attempt to prevent what she anticipates will be a tumultuous response on her father’s part. She exclaims to Will, “You have no sense of the place.” However, More does not erupt; he simply yawns, “He’s no sense of the time.” Despite More’s strong feelings against heresy, he lightens the moment by appearing to be more concerned with a suitor staying too late. Even at his trial, More’s wit does not abandon him. The Duke of Norfolk reminds More, although charged with a capital offense, that his life still lies in his own hands. More responds, “Then I’ll be sure to keep a firm grip on it.” Perhaps the humor, on display in A Man for All Seasons, is warning us not to take Utopia too seriously. Chambers view became a common analysis of Utopia in the early twentieth-century. Prior to that time, much treatment of the work saw it as a sincere proposal. In fact, More’s contemporaries such as Erasmus, as one would expect of Christian Humanists, certainly held the goal of improving Europe. Such an interpretation was held for centuries by many including Marx and Engels. Before the twentieth-century, it was, perhaps ironically, Catholic scholars who were some of the first to approach the work with a stress on its dialogical nature. This placed greater emphasis on the presentation of the discourse than any societal recommendation. This represented a move away from Ciceronian rhetoric, with its goal to instigate improvement, to the more cynical Lucian rhetoric. This view of indictment without endorsement is essential to understanding Utopia as a satirical allegory. In addition, Bolt’s depictions of More’s humor also lend credence to the argument that Utopia is not meant to be a blueprint for society. This view is further supported by Richard Marius’s evaluation of Utopia: “It is not a cry for reform but a bid for supporting ironic smiles” (158). Another aspect of congruity between the 1516 text and 1966 film is revealed as the above conversation between Wolsey and More continues. “Why did you oppose me?” Wolsey asks. “I thought your Grace was wrong,” More answers in a matter-of-fact tone. Wolsey responds, “Matter of conscience? You’re a constant regret to me Thomas. If only you could see facts flat on without that horrible moral squint . . . with a little common sense, you could have made a statesman.” Aside from Wolsey’s own attempt at irony, (as a member of the King’s council, More is unarguably a statesman), the comment has specific resonance in light of the major issue in Book One of Utopia—to be or not to be a statesman. In Book One, More (the character) and Peter Giles play tug-of-war with Raphael Hythloday. More advocates the life of a courtier, but Hythloday believes such an endeavor to be futile. Hythloday observes that the sovereign is surrounded by too many sycophants. Hythloday declares to More, “How can one individual do any good when he is surrounded by colleagues who would more readily corrupt the best of men than do any reforming of themselves?” (More 35). More’s response is that the courtier must give good counsel, even if he must, at times, seem to go along with contrary opinions. The statesman’s goal is to be a positive influence as much as he can, despite the pressures from other quarters, as More states, “Advice to a prince would be of the greatest advantage to the public welfare. This, after all, is the chief duty of every good man . . . No wonder we are so far from happiness, when philosophers do not condescend even to assist kings with their counsels” (More 27). These words from Utopia are central to More’s final stand in the film and are encapsulated in the film when Wolsey asks More, “Explain how you, a counselor of England, can obstruct these measures for the sake of your own private conscience?” The cinematic More responds with what is the crux of Utopia’s Book One: “I think that when statesmen forsake their private conscience for the sake of their public duty, they lead their country by a short route to chaos.” Both film and text advocate “correct” council, but even “correct” council, i.e. what the counselor sees as right, must be performed with great stealth. His hesitation is further highlighted during his meeting with the King (see Figure 4). Henry describes More as being “readier to be friend than Chancellor.” In this scene, Hythloday’s assessment of royal advisors as fawners seems, at first, to apply to More. “That air they played…it had a certain…well, tell me what you thought of it,” Henry inquires of More. More replies with a question, “Could it have been your Grace’s own?” The King laughs lightly, “Discovered. Now I’ll never know your true opinion and that’s irksome. For we artists, though we love praise, yet we love truth better.” This is the essence of the dilemma Hythloday wishes to avoid. Here, More seems to play politics, “Then I will tell Your Grace my true opinion . . . To me, it seemed delightful.” The King is pleased at what seems to be More’s flattery, “Thomas, I picked the right man for Chancellor.” Before Henry can complete his triumph, More interrupts, “I should in fairness add that my taste in music is reputably deplorable.” It seems, for More at least, that it is possible to be both political and honest, as is suggested in Utopia, “There is another philosophy that is better suited for political action, that . . . adapts itself to the drama in hand” (More 33). HENRY: Because you’re honest. And what’s more to the purpose, you’re known to be honest. There are those like Norfolk who follow me because I wear the crown. There are those like Cromwell who follow me because they are jackals with sharp teeth and I am their tiger. There’s a mass that follows me because it follows anything that moves. (pause) And then there’s you. Obviously, More’s willingness to compromise or “play the game” has not prevented him from earning a reputation for integrity. CROMWELL: I know a man who wants to change his woman. Normally a matter of small importance, but in this case, it is our liege Lord Henry, the eighth of that name. Which is a quaint way of saying that if he wants to change his woman, he will. And our job as administrators is to minimize the inconvenience which this is going to cause. That’s our only job, Rich, to minimize the inconvenience of things. This description of a royal counselor sounds like it could have come straight from Hythloday. The difference would be that Hythloday would be accusatory while Cromwell would approve of such acquiescence. Thomas More, both as the author of Utopia and as a character in A Man for All Seasons, is the mean between the extremes of Hythloday’s idealism and Cromwell’s pragmatism. ROPER: Yes. I’d cut down every law in England to do that. MORE: And when the last law was down and the Devil turned ‘round on you, where would you hide, Roper? The laws all being flat. This country is planted thick with laws from coast to coast, Man’s laws not God’s, and if you cut them down, and you’re just the man to do it, do you really think you could stand upright in the winds that would blow then? I give the devil benefit of law for my own safety sake. Here, More is even subordinating, in a fashion, heavenly order to earthly organization. It would seem that A Man for All Seasons confirms Utopia as an exercise in the submission of the ideal to the practical. It is also interesting to note that England is “planted thick with laws” while Utopia has very few laws. This might well suggest the impracticality of More’s fictitious society. The lawyer More, who strove to conform himself to the law and the law to himself must have realized that a society based on a consensus of what was good and desirable (see next section), and therefore requiring minimal codification, could never achieve fruition. MORE: Listen Meg, God made the angels to show Him splendor, as He made animals for innocence and plants for their simplicity. But Man He made to serve Him wittily in the tangle of his mind. If He suffers us to come to such a case that there is no escaping, then we can stand to our tackle as best we can. And yes Meg, then we can clamor like champions. If we have the spittle for it. But it’s God’s part and not our own to bring us to such a pass. Our natural ability lies in escaping. If I can take this oath I will. It seems, as Niloufer Harben indicates, that “For all More’s idealism there is an extremely practical side to his nature . . . as he strives to evade disaster by every legal trick his subtle mind can employ” (156-7). That a man, who would remain steadfast to his beliefs to the point of martyrdom, would profess that Man’s “natural ability lies in escaping” seems to be—at least at this point—another endorsement for practicality over idealism. Ultimately, More is not able to take the oath; for him, compromise has a limit. It is this image of the steadfast More which most exemplifies the film and is eerily predicted, by Hythloday in Utopia, “A man who went along only halfheartedly even with the worst decisions would immediately get himself a name as a spy and perhaps a traitor” (More 35). 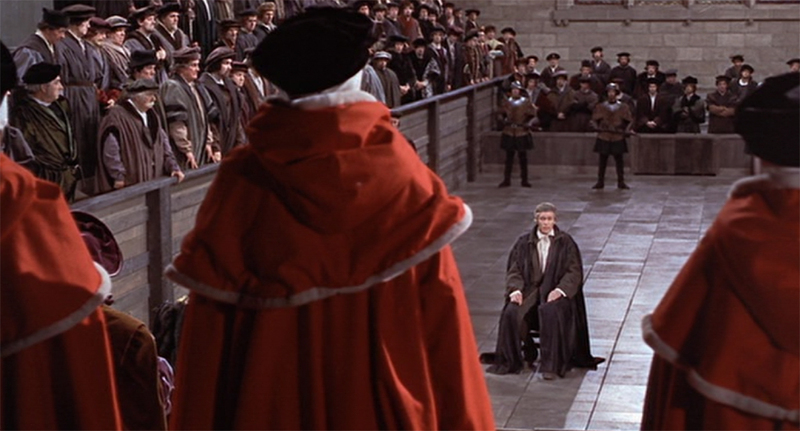 Being condemned as a traitor is, of course, More’s ultimate fate for not going along wholeheartedly with the King’s desires, as depicted in the memorable climax of the film, his trial (see Figure 5). More, the author of Utopia, is well aware of the impracticality, if not downright impossibility, of his ideal community, yet many have seen it as More’s recommendation for a better society. Richard Marius believes that there should be no controversy: “The communism in Utopia was certainly a moral statement rather than a program for action” (186). Marius is pointing out, as we have earlier, the Humanist’s ability to critique without offering solutions. There is a moment in A Man for All Seasons which addresses this issue. Wolsey admonishes More for suggesting that prayer may be a solution to their political dilemma. More, with a slight smirk, as though his tongue is firmly planted in his cheek, reassures Wolsey to not worry, “We shall have my prayers to fall back on. 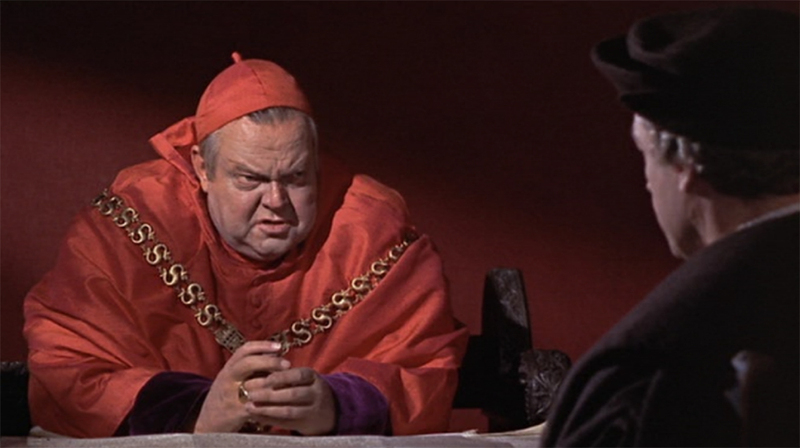 “Wolsey grunts derisively, “You’d like that wouldn’t you, to govern the country with prayer?” More’s smile disappears and he responds quite seriously, “Yes I should.” Wolsey scoffs because, for him, governing with prayer is hardly a practical solution. More, however, although he plays the “worldly” game, knows that true answers lie beyond secular remedies. Deep down, More knows you cannot govern with just prayer, and yet he advocates it wholeheartedly. This is the essence of Utopia, as the text states: “For it is impossible to make everything good unless you make all men good, and that I don’t expect to see for a long time to come” (More 34). This sentiment begins to bridge practical More with idealistic More; it also begins to resolve generations of analytic dichotomy induced by Utopia. Besides servants and jailers, who have no desire to play on the grand scale nor take part in the tribulations that can accompany such larger than life roles, Bolt is also suggesting that there is a link between the Common Man and Common Sense. In Sensus Communis, John Schaeffer defines common sense as both “practical judgment,” which is the way we most often employ the term, but also as “the common opinion of the ordinary man” (2). Similarly, in Utopia, common sense does not just mean that faculty of the intellect that comes naturally; it also refers to that thinking which the community holds in common. In Utopia, all men are, supposedly, in agreement as to what makes a healthy commonwealth, as Marius asserts, “In his Utopia, he could hold that we have a natural religious consciousness, and . . . that religious consciousness was general” (182). Thus, in Utopia, Schaeffer’s two definitions can coexist, but in A Man for All Seasons, they seem to be irreconcilable. We have already discussed the struggle between idealism and practicality in the section on statesmanship and the distinction between the two is even more pronounced in A Man for All Seasons where the common sense of the common man seems to preclude any idealism. The irreconcilable nature of practicality and idealism is clearly seen in the film when an imprisoned More is visited by his daughter. She attempts to employ common sense to convince her father to submit to the King. “In any state that was half good, you would be raised up high, not here, for what you’ve done already,” she argues. “It’s not your fault the state’s three-quarters bad,” she continues, “then if you elect to suffer for it, you elect yourself a hero.” More acknowledges the neatness of her argument, but he retorts, “If we lived in a state where virtue was profitable, common sense would make us saintly. But since we see that avarice, anger, pride and stupidity commonly profit far beyond charity, modesty, justice and thought, perhaps we must stand fast a little—even at the risk of being heroes.” The incarcerated More seems to be describing his Utopia with the words “a state where virtue is profitable.” After all, Utopia is supposed to be that society where common sense and virtue are one in the same. In other words, there are no Mores in Utopia, because there are no heroes, because virtue and practicality are not at odds. Unfortunately for the historic More, the two are, in the real world, very greatly at odds, as A Man for All Seasons attests. “As long as you have private property, and as long as money is the measure of all things, it is scarcely ever possible for a commonwealth to be just or happy” (More 35). Greed, according to Hythloday, is the root of all society’s ills. In Utopia, personal property has been done away with and therefore greed, supposedly, no longer exists. In A Man for All Seasons, More, in realizing that a silver cup is a bribe, throws the cup into the river. His boatman quickly grabs it back from the water and says to More in astonishment, “That’s worth money, Sir.” More nods in reluctant agreement and takes the cup back. This is a concession that worldly value is inescapable and possibly a confession that Utopia is not a viable solution to the iniquities of the world. Again, we see the struggle between idealism and practicality. But Richard, that’s a little bribe. At court they offer you all sorts of things. Whole Manors, Manor Houses, Coats-of-Arms. A man should go where he won’t be tempted. Why not be a teacher? You’d be a fine teacher. Perhaps a great one. Is More trying to push Rich toward Utopia? Education was a cornerstone of Christian Humanism, so it would be completely appropriate for More to envision a career in pedagogy as equivalent with utopia. Unfortunately, Rich responds, “If I were, who would know it?” This confirms, as Utopia suggests, that the basis of greed is pride. The cinematic More also links pride with greed when, upon losing his position at court, More jests, “I am no longer a great man. I no longer require a great household.” Both the film and the text link pride to the need for possessions as a sign of greatness. This desire for prominence is the tragic flaw in Rich and it is the target of Utopia’s apparent assault on private property. Cromwell’s forecast for Rich could not be more accurate; it does become easier for Rich. This slippery slope appraisal of evil is the essence of Utopia’s need for complete removal of all inducements to sin. “The happiness of the Utopian republic, which has abolished not only money but with it greed! What a mass of trouble was cut away by that one step! What a multitude of crimes was pulled up by the roots!” (More 95). Rich is the embodiment, and story-long example, of the core issues in Utopia: Pride and Want. Moreover, the text clearly indicates pride as the most pernicious. In fact, Hythloday believes that Utopian ways could be universally adopted, “if it were not for one single monster, the prime plague and begetter of all others – I mean Pride” (More 96). This argument is difficult to deny in the face of Rich’s ultimate perjury at More’s trial. For his mendacity, Rich is made Attorney General for Wales. Rich’s decline (or rise, depending on your view) from silver cup to Attorney General seems triumphant, but More reminds him, “Rich, it profits a man nothing to give his soul for the whole world. But for Wales?” We see in this paraphrasing of scriptures that More puts a Christian brand on Utopian philosophy. The affection lacking in Utopia is not answered even by familial devotion in A Man for All Seasons, as demonstrated when Alice, More’s wife, admonishes him for being “content to be shut up here with rats when you might be home with us.” Earlier in the film, the imperfection of earthly devotion is professed by More when arguing friendship with the Duke of Norfolk, “Affection goes as deep in me as you. But only God is love right through. And that’s myself.” The cinematic More’s positioning of love above reason and divine love above earthly love provides reconciliation between the two books of Utopia and between practicality and idealism. The missing element of Utopia, love, is the reason so many have found an irreconcilable dichotomy between the work and the man behind it. The problem of reconciling the historic More with the More of Utopia, as well as the concepts of practicality and idealism, between escape and martyrdom, between societal improvement and whimsical satire, are all unbridgeable without understanding the relationship between this world and the next as More would have understood it. More could never have advocated a society absent love of one another and certainly not absent the love of God. Those critics who argue over the true meaning of Utopia without understanding that “God is love right through” are doomed to failure. Those who would seek to interpret Utopia would do well to include a scrutiny of A Man for All Seasons. 1 All film references are from A Man for All Seasons (1966). 2 All citations from Utopia are from the 2011 Norton Critical 3rd edition which is a revised translation by George M. Logan from an earlier translation by Robert M. Adams in 1975. 3 Perhaps this spectrum of interpretation is best exemplified, at one end, by Karl Kautsky (1888) as an advocate for seeing the work as a proto-Communist manifesto and, at the other end, C.S. Lewis (1954) who saw the work as a delightful exercise in amusement. 4 To read more on this moment of change in American cinema, see Giannetti and Eyman’s Flashback: A Brief History of Film, pp. 221-244. The authors refer to this decade as “schizoid,” embracing both complacency and militancy. 5 Robert Burgoyne reminds us that “although much of the public debate concerning history and film has centered on questions of a given film’s fidelity to the historical record and its potential to mislead, the historical film has also been recognized for its ability to establish an emotional connection to the past” (1-2). 6 In Fred Zinnemann and the Cinema of Resistance, J. E. Smyth indicates that the two identifying characteristics of a Zinnemann hero are individualism and masculinity. The Zinnemann protagonist could display vulnerability “without compromising his personal integrity” (117). Allen, J. W. “The Saddest of Fairy Tales.” Twentieth-Century Interpretations of Utopia, edited by William Nelson, Prentice-Hill, 1968. Bordwell, David. "Classical Hollywood Cinema: Narrative Principles and Procedures.” Narrative, Apparatus, Ideology: A Film Theory Reader, edited by Philip Rosen, Columbia UP, 1986,pp. 17-34. Burgoyne, Robert. The Hollywood Historical Film. Blackwell, 2008. Chambers, R. W. Thomas More. Newman, 1935. Giannetti, Louis and Scott Eyman. Flashback: A Brief History of Film. Allyn & Bacon, 2010. Harben, Niloufer. Twentieth-Century History Plays. Macmillian, 1988. Hayman, Ronald. Contemporary Playwrights: Robert Bolt by Ronald Hayman. Heineman, 1970. A Man for All Seasons. Directed by Fred Zinnemann. Columbia, 1966. Marius, Richard. Thomas More: a Biography. Knopf, 1984. More, Thomas. Utopia. Edited by George M. Logan. 3rd ed., Norton, 2011. Palmer, Richard H. The Contemporary British History Plays. Greenwood, 1998. Schaeffer, John D. Sensus Communis. Duke UP, 1990. Smyth, J. E. Fred Zinnemann and the Cinema of Resistance. UP of Mississippi, 2014.